The cool thing about science fiction and fantasy is that it allows us to examine what makes us human. Because more often than not, the genre features a protagonist or group of protagonists with capabilities beyond those of ordinary humans. And sometimes we watch how extraordinary humans cope with still living an ordinary life, or learning to adjust to a different one. This article is a survey of Supergirl, Star Wars, and the Marvel Cinematic Universe. But there is one quote from Harry Potter that I want to emphasize: It is our choices that show who we truly are, far more than our abilities. I know I covered the issue of choices earlier in the year, but it’s worth discussing in the context of superpowers—of any powers. Other people will label you because of what you can do. They may or may not trust you because of how you’re different. People sometimes think that those labels define who they are and what they’re supposed to do. But how you choose to use and develop your gifts has nothing to do with how you’re branded or what they do to you. If you’re not going to use your super strength and laser vision to kill people, then you’re not a murderer even if people think you could be. If you’re going to use those powers to save people in danger and fight crime, all the better. You can be a hero whether or not people like you. The essential question to ask is, do those gifts help you to become the person you want to be, or do they make you less sensitive to the important things in life? Let’s look at the Kryptonians in the DC universe, for example. Earth is a smaller planet than Krypton and it has a different sun–that is why when Kryptonians come to earth, they are physically stronger than humans and have laser vision, ice breath, etc. Whichever storyline you are looking at, it probably never took Clark Kent very long to figure out he had special abilities. It was probably not long after that when he realized that his abilities made him different from other people around him. I’m interested to see if or how Supergirl will depict his story or what he decides to share about his life with Kara. Sometimes it’s not so much being born different as finding out later in life that you are different, or something happens that makes you different. 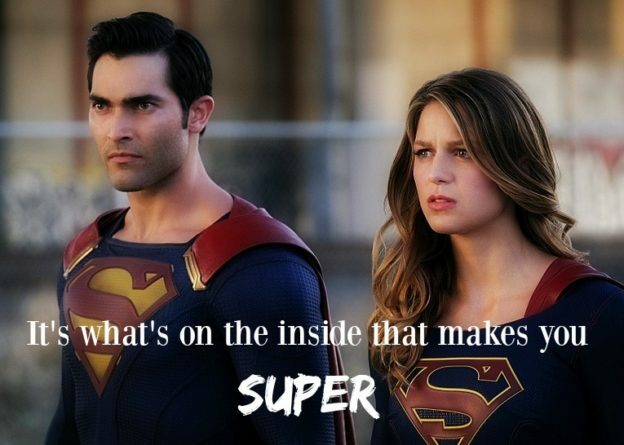 Taking a look at the Supergirl storyline, Clark’s cousin Kara had to deal with a different set of issues with her superpowers. She came to earth as a preteen. She remembered Krypton, and she was probably told how life on Earth would be different before she came. If you recall in flashbacks during the episode ‘Manhunter,’ Kara had problems at first adjusting to the different conditions on earth, and her abilities were more like dis-abilities, with the x-ray vision giving her sensory overload, for example. She realized that her powers could be used to help people, but her adoptive family asked her to hide her abilities for her own protection–because they feared people would be afraid she could hurt them. As an adult, Kara Danvers found embracing her superpowers and being a hero to be liberating. While her friends and family supported her, she had numerous critics of what she should be doing and how. She doesn’t let that stop her from saving the day. In ‘Human for a Day,’ Kara faces a temporary loss of her powers just when an earthquake hits National City and everything else goes wrong. It is frustrating to her to not be able to use her abilities to help people the way she’s used to. But then she stops a looter from breaking into a store by sheer persuasion—he had her at gunpoint on the one day she wasn’t bulletproof, and she got him to put the gun down. 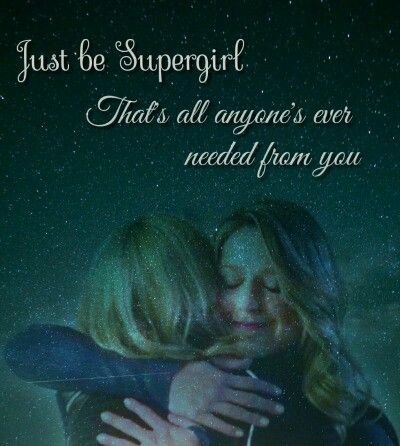 Kara is still Supergirl because of who she is as a person, not because of her abilities. It is because of her own goodness and her belief in the inherent goodness of other people that she uses her power for good. Livewire, in contrast, receives her powers from a bolt of lightning that struck her through Supergirl while she was being rescued. Leslie Willis was already a bit of a drama queen when that incident occurred, and Cat Grant had just fired her from being a radio show host. When Leslie wakes up, she finds out that she could conjure lightning to attack people who hurt her, and she decides that she didn’t need to do things the conventional way anymore. “Leslie Willis is dead,” she gloatingly tells Cat Grant when she comes to kill her. “You killed her.” Livewire is getting revenge for the loss of her normal life, and at the same time creating a new identity for herself as a supervillain. When Siobhan Smyth comes to Leslie’s aid with her banshee scream and her own vendetta for revenge, Leslie encourages her to do the same. In our favorite galaxy far far away, prior to the Jedi purge the standard routine for anyone sensitive to the Force was to be taken to the Jedi temple and trained to be a Jedi. Anakin Skywalker followed this route. The view of the Jedi Order was that human attachments and material possessions were unimportant because they kept one from being able to use the Force. Partly because this view of the Force, but partly because of his own selfishness, Anakin thought he could–or should–be able to use the Force to do everything he wanted. His desires to achieve rank within the Jedi Order took a toll on his relationship with Padme because he didn’t really see issues the way she did: Anakin saw power as the way to achieve peace in the galaxy, but Padme valued human agency and freedom. The result? Anakin was deceived into thinking the Dark Side could give him power over death, and traded his humanity for a lifetime at Palpatine’s side, a shell of his former self. Luke Skywalker was older and wiser when Obi-wan initiated him and Yoda later trained him. His abilities grew as he continued his training, no doubt about it, but unlike Anakin he had a different (and I want to say better) moral upbringing, and he saw the Force as secondary to having faith in human goodness and the more important ability to love. Vader and Palpatine both thought they could exploit Luke’s feelings for his friends and family to get him to turn to the Dark Side, and they nearly succeeded. Of more interest, they told Luke that the Dark Side was his destiny, as if being good or evil was who he was as a person and not by his actions. But Luke knew that the choice was ultimately his, to be light or dark. And he knew that even though his father was trapped under Vader’s mask, he still had the potential to do the right thing. A generation later, in The Force Awakens, we have Kylo Ren, formerly known as Ben Solo. So far we only have sketchy clues about how he turned to the Dark Side. My guess is that at a young age, Ben showed unnatural displays of power and a tendency to favor the powers of the Dark Side–Leia mentions that she saw “too much Vader in him”. 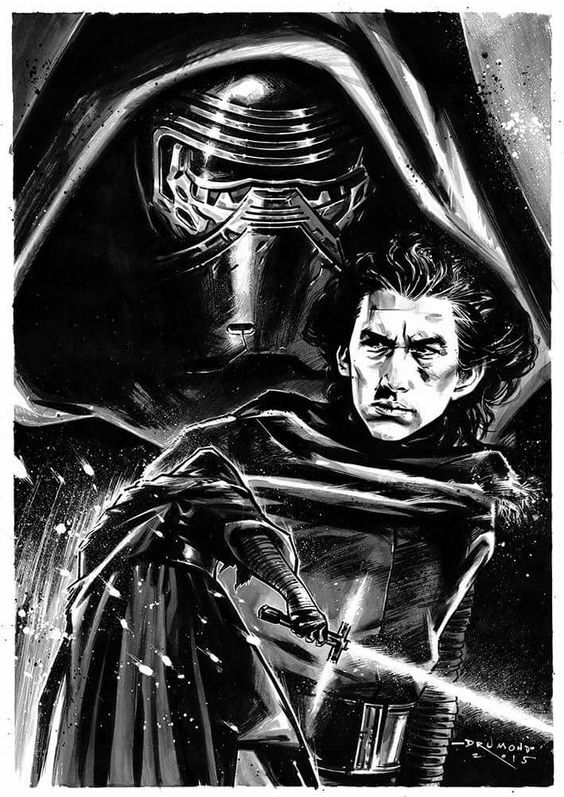 Ben must have felt the pressure of too many people telling him what to do and chose the Dark Side because it came easier to him, and he believed (falsely) that it made him stronger. I think maybe resentment for his family fueled it, too–they kept telling him to choose the light even though he believed he was Dark no matter what. Even though after he had long been in Snoke’s service, he could still feel the call to the Light. But he still rejected it. He saw the Dark Side as who he was and something he had to prove he could use. He killed his own father because he didn’t want to have that association with the Light Side anymore. One of the reasons Captain America: The First Avenger had such a profound affect on me when I first saw it was because of the contrast between Steve Rogers and Johann Schmidt. The scene where Erskine tells Schmidt’s backstory sets the stage for not only the conflict between the hero and the villain but brought out the themes that are explored in the film. The serum that Erskine created had some kind of effect on parts of the brain that deal with personality and morals. Combined with the physical affects, the serum somehow reveals a person’s inner beauty or ugliness. Steve Rogers, of course, was already a good man, and he stayed good–he put his power to use to protect the world. Schmidt was steeped in ideology that confirmed his own self-importance and lust for superiority and conquest. He became a monster. 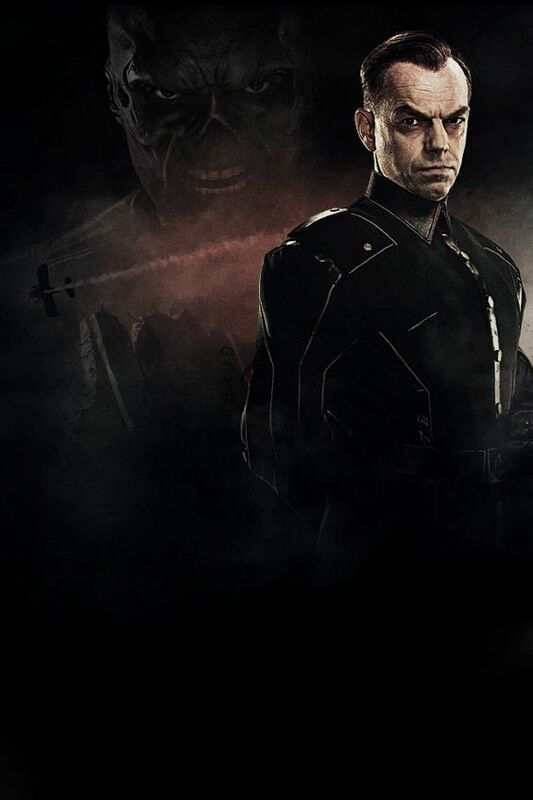 The reason behind that first confrontation between Cap and Red Skull, oddly enough, was that Steve was rescuing Bucky, who had been selected by Schmidt and Dr. Zola for experimentation. He was probably selected by chance, and by chance he survived the first round. Yes, I know I’ve gone over Bucky’s story ten times already for you guys, but there are a lot of things we can learn from it. Schmidt was all right with the serum not working so good for him, but he and Zola were looking into creating their own super-soldiers—without the personality effects. Did Zola’s later experiments on the Winter Soldier find a way to negate them? When the mask falls off, the man behind the Winter Soldier’s mask is devoid of personality and memory. He doesn’t respond to the sight of an old friend. He is a puppet with which Hydra does its dirty work. Brainwashing works because if you don’t know who you are, and you don’t remember right from wrong, then people can tell you to do whatever they want and you won’t complain about it. There is no agency without knowledge. After leaving Hydra, Bucky goes into hiding because he knows that as the Winter Soldier he was labeled a terrorist and a murderer, and people wouldn’t have cared if he was brainwashed. In Captain America: Civil War, we see firsthand that even after all he’s been through Bucky is a good person and he wants to do the right thing. The fighting and killing when he’s not triggered is self-defense. The Winter Soldier programming did not come from him: that is not who he is. I cannot emphasize this enough because I’m just so amazed and relieved that that’s how he turned out. And it makes that mid-credit scene all the more poignant—and painful. Getting superpowers is a life change, even if it’s not a dramatic one. It can affect your personality, it can affect how you’re able to live. Depending on what you can do with your powers, other people may or may not let you live a normal life anymore. So what do you do? Do you decide to make them even more afraid of you and turn your back on everything? Do you give up trying? Or do you adjust your course and still do what’s right? Do you let go of everything that makes you YOU—your hobbies, your career, your loved ones—or do you keep holding on and do your best to stay human while being super? Lizy Cole is originally from San Antonio, Texas but also has strong ties to Arizona. She graduated from Brigham Young University with a bachelor's degree in English. She enjoys reading, writing, and being a fangirl. Her current big fandoms are Harry Potter, The Lord of the Rings, Star Wars, and the Marvel Cinematic Universe. This entry was posted in DC Comics, Fandoms, Marvel, Star Wars and tagged Captain America, Captain America Civil War, Darth vader, Marvel Cinematic Universe, Star Wars, Supergirl, Superman, The Force Awakens, The Winter Soldier on October 12, 2016 by Lizy Cole.